Our team will welcome you and after exploring our vineyards you will get to know our gravityflow winery where the wine are aged in French oak. you Will learn each step of the production of our wines. The visit culminates in a tasting of three wines from Cachapoal Andes Valley: Cabo de Hornos, Sideral and Altair. Hidden in the Andes Mountains and near the town of Requinoa it is located the wine cellar that is home to Grandes Vinos de San Pedro. 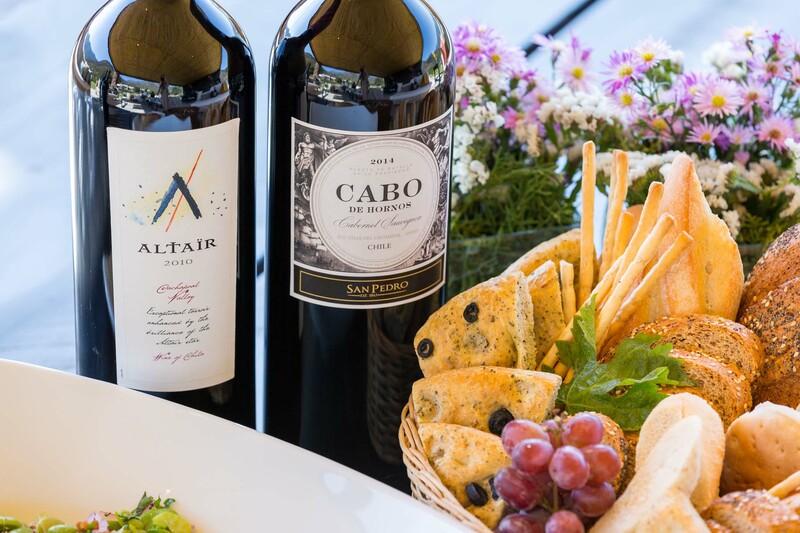 Here you can live customized experiences, ask for wine tastings with panoramic views to the vineyards, take tours to the modern wine cellar and countryside, and finally enjoy exquisite Creole barbecues in the vineyard’s quincho. You will be asked to pay 25% of the total price, and the rest on day of your tour. These terms and conditions regulate the use of Viña San Pedro Tarapacá S.A. (“VSPT Wine Group” or VSPT Wines”) website, available at http://vsptwinegroup.com/ (hereinafter the “Website”), especially the relationship between VSPT Wines and yourself, relating to transactions carried out through this Website in accordance with applicable and current Chilean regulations. The content of the Website provides information about VSPT Wines, the companies that conform it, its products and services, in addition to allowing the contracting and reservation of tourism services and events with the mechanisms that the Website itself offers for this purpose (the “Services”), in accordance with the terms and conditions established herein. In order to use the Website and to contract and reserve the Services you must have the legal capacity to contract and accept these terms and conditions. If you do not agree with any of its provisions, you should abstain from using the Website. To book the Services through the Website, you must complete the form provided for this purpose with the information and personal data requested, in addition to payment of 25% of the price of the respective Service. In accordance with VSPT Wines’ responsible drinking policy, minors are not permitted on tours unless expressly authorized in writing by parents or guardians, indicating that they assume all responsibility for the participation of minors on tours. Under no circumstances may minors participate in tastings. The prices of each of the Services published on the Website shall correspond to those in force on the date on which the respective booking is made. All prices include VAT (Value Added Tax). VSPT Wines reserves the right to make, at any time and without prior notice, the price modifications it deems appropriate, which will be duly and timely reported on the Website. Payments of 25% of the price of the Services will be made through the WEBPAY system, by means of credit and debit cards from banks associated with it, without prejudice to other mechanisms that may be implemented in the future. The use of the bank cards associated with WEBPAY is subject to the agreement between you and the relevant issuing bank, therefore all aspects of the use of the cards are governed by the respective applicable contracts. As a consequence of the foregoing, VSPT Wines shall not be liable for any circumstances resulting from the use thereof. The operation and use of the WEBPAY system is the sole responsibility of TRANSBANK. As a consequence of the foregoing, VSPT Wines shall not be liable for any circumstances resulting from such operation and use. Availability of quotas and dates for the provision of the corresponding Service. That the payment of 25% of the price of the respective Service has been verified. That the data registered by yourself on the Website match with those informed when contracting the Services and accepting the offer. VSPT Wines will send you a written confirmation by e-mail to the box you have entered in the appropriate form. For the purposes of Article 3 bis of Law No. 19.496 on Consumers Protection, VSPT Wines expressly provides that you may not resign from the Services you may contract through the Website. In case you cancel your reservation before the date on which the Service will be provided or that day you do not attend to receive it, VSPT Wines shall be entitled to withhold any sums paid by you and you may not request its refund. Additionally, you may not request the delivery of goods that could be included in certain Service such as wine and food. However, you understand and agree that VSPT Wines may cancel the Service or fail to provide it at the agreed time and place in the event that weather conditions or other factors outside its reasonable control affect or may affect the safety or proper provision of the Service, or in the event that VSPT Wines is prevented from doing so by a fortuitous event or force majeure. In such cases, VSPT Wines will refund any amounts paid within 60 following days of VSPT Wines’ communication of such a situation to you. VSPT Wines or any of its subsidiaries or related companies is the owner or licensee of all rights to the content of this Website, including, but not limited to, the layout of the Website, text, photographs, music, trademarks and logos, software used and the domain name “vsptwinegroup.com” itself, hereinafter the “Contents”. The rights to the Contents, including but not limited to the permanent or temporary reproduction not required for access to this Website; its distribution in whole or in part by any means; its modification, adaptation or translation; and its making available to the public, is prohibited and may be considered an offence under current law, unless expressly authorized in writing by VSPT Wines. Without prejudice to the foregoing, the ownership of the intellectual or industrial property rights corresponding to any material uploaded to this Website by users or third parties, by any means whatsoever, is the exclusive responsibility of the contributors. In the event of plagiarism or infringement of third party rights or of the law, the third party contributor of the respective materials shall be solely liable to the owner and/or the appropriate authority. If the Website so permits, the establishment of hyperlinks or links from other websites should always lead to the home page or index of the Website. The information and personal data you provide through the Website, for whatever purpose, must be accurate, up to date, complete and reliable. You must inform VSPT Wines as soon as possible of any information that for any reason no longer reflects your actual situation. You declare that any information you provide is duly authorized and you consent to such data being processed in a way that may or may not be automated. Personal data is stored in registers or databases owned by VSPT Wines which are not accessible to the public. However, VSPT Wines is entitled to contract personal data processing and analysis services from third parties, who will act as representatives in accordance with the law. VSPT Wines may use personal data for the purpose of validating the hiring and booking of Services, receiving payments or making refunds and improving the information and marketing of the products and services provided by VSPT Wines on the Website; for the proper management and administration of the Website; to be able to provide, offer, expand and improve the services offered through the Website; to adapt such services to the preferences and needs of its customers and users; to be able to determine and/or anticipate such preferences and needs; and to update the information on services and products offered by VSPT Wines. VSPT Wines may also use personal data to send you surveys, as well as commercial or advertising communications by e-mail or other messaging systems, subject to the provisions of Article 28 B of the Consumer Protection Law No. 19.496. You acknowledge and agree that the software and the equipment and networks in which they operate are tools for the processing and transmission of data that by their nature are subject to certain failures, either in their own operation or in their programs, contingency to which any administrator or provider of such tools is exposed and that does not disappear by virtue of acceptance of these terms and conditions or the provision of any Service offered through the Website. Therefore, to the fullest extent permitted by law, VSPT Wines shall not be liable for any damages resulting directly or indirectly from the interruption, suspension or termination of the Services offered by the Website, unless there is gross negligence or malicious intent by VSPT Wines in accordance with the law. VSPT Wines reserves the right, in its sole discretion, to change, modify, add or remove at any time any part of these terms and conditions. Please review these terms periodically for changes. In the event of a substantial change in the terms and conditions, it will be necessary to accept them again to continue using the Website. These terms and conditions regulate the use of Viña San Pedro Tarapacá S.A. (“VSPT Wine Group” or VSPT Wines”) website, available at http://vsptwinegroup.com/ (hereinafter the “Website”), especially the relationship between VSPT Wines and the tourist operator or agency you represent, relating to transactions carried out through this Website in accordance with applicable and current Chilean regulations. In order to use the Website and to contract and reserve the Services you must have the legal capacity to contract on behalf of the tourist operator or agency you represent and accept these terms and conditions. If you do not agree with any of its provisions, you should abstain from using the Website. To book the Services through the Website, you, on behalf of your tourist operator or agency, must complete the form provided for this purpose with the information and personal data requested, in addition to payment of 25% of the price of the respective Service. Payments of 25% of the price of the Services will be made through wire transfer or deposit in the current account of VSPT informed on the Web Site, without prejudice to other mechanisms that may be implemented in the future. VSPT Wine will not be responsible for the operation and use of the system for wire transfers and deposits provided by the corresponding banking entities. For the purposes of Article 3 bis of Law No. 19.496 on Consumers Protection, VSPT Wines expressly provides that the tourist operator or agency you represent may not resign from the Services you may contract through the Website. In lieu of such resignation, VSPT Wines grants the tourist operator or agency you represent the right to cancel any booking for any Service at least 15 days prior to the date of provision of the Service, in which case VSPT Wines will refund the amounts paid, either the total price of the Services or its reservation, as applicable. The tourist operator or agency you represent may notify VSPT Wines of the cancellation of the Service through the means referred to on the Website. In case a reservation is not canceled by the tourist operator or agency your represent within the term established in section 2.2, VSPT Wines shall be entitled to withhold any sums paid by such tourist operator or agency you and the same may not request its refund. Additionally, the tourist operator or agency you represent may not request the delivery of goods that could be included in certain Service such as wine and food. However, both you and the tourist operator or agency you represent understand and agree that VSPT Wines may cancel the Service or fail to provide it at the agreed time and place in the event that weather conditions or other factors outside its reasonable control affect or may affect the safety or proper provision of the Service, or in the event that VSPT Wines is prevented from doing so by a fortuitous event or force majeure. In such cases, VSPT Wines will refund any amounts paid within 60 following days of VSPT Wines’ communication of such a situation to the tourist operator or agency you represent. The information and personal data you, on your behalf or on behalf of a tourist operator or agency, provide through the Website, for whatever purpose, must be accurate, up to date, complete and reliable. You must inform VSPT Wines as soon as possible of any information that for any reason no longer reflects your actual situation. You declare that any information you provide on your behalf or on behalf of a tourist operator or agency is duly authorized and you consent to such data being processed in a way that may or may not be automated. VSPT Wines may also use personal data to send you or the tourist operator or agency you represent surveys, as well as commercial or advertising communications by e-mail or other messaging systems, subject to the provisions of Article 28 B of the Consumer Protection Law No. 19.496. You and the tourist operator or agency you represent acknowledge and agree that the software and the equipment and networks in which they operate are tools for the processing and transmission of data that by their nature are subject to certain failures, either in their own operation or in their programs, contingency to which any administrator or provider of such tools is exposed and that does not disappear by virtue of acceptance of these terms and conditions or the provision of any Service offered through the Website.